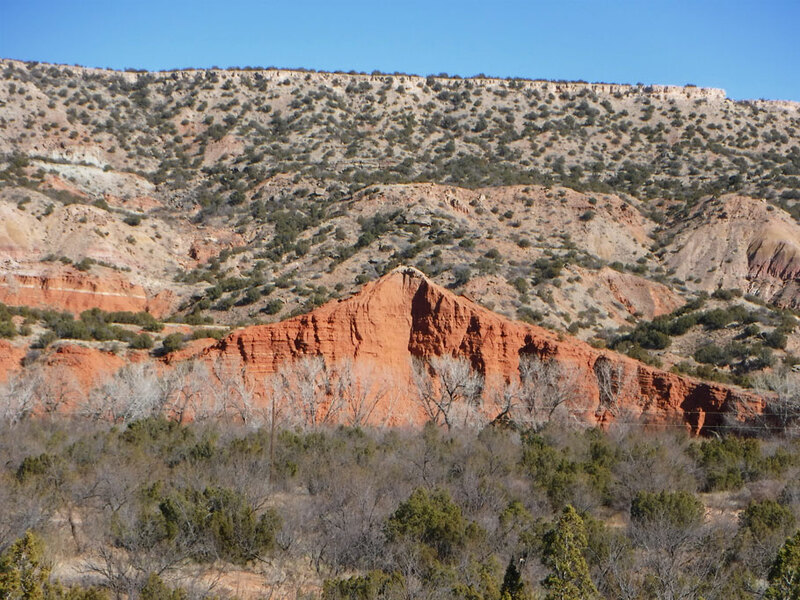 View of Palo Duro canyon from the CCC trail near the visitor center. We do not have much of an agenda for this trip. It is mostly just a list of friends and places we’d like to visit with date ranges when we expect these visits might happen. But in January we did have date and place for one thing, a meetup of travelers and van dwellers called the Rubber Tramp Rendevous. This was in Quartzsite, Arizona on January 10. When we left Menard, we had 10 days to get there. 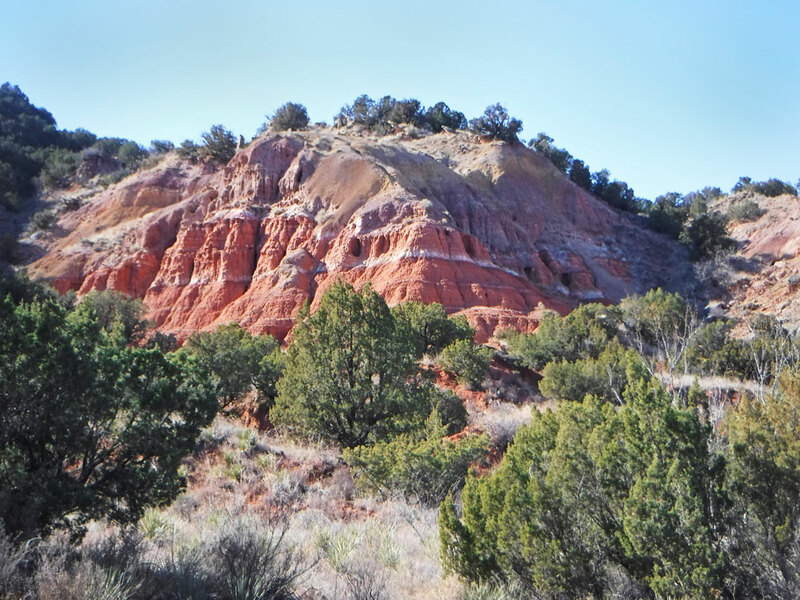 At 120 miles long with depths up to 800 feet, Palo Duro is the second largest canyon in the U.S. Just south of Amarillo, Texas, it was named by the Spanish for the â€œhard woodâ€ of the Rocky Mountain Junipers found there. The Prairie Dog Town Fork of the Red River has been carving out this canyon for over a million years, exposing 250 million years of strata to the sunlight. In 1933 the Civilian Conservation Corps (CCC) sent seven companies of men here to run roads, and build a visitor center and cabins. Texas opened the site as a state park in 1934. A paved road loops from the visitor center at the top down through the canyon floor. From the road some 35 miles of hiking, biking, and equestrian trails allow you to explore the canyon. We just spent one day, so we only hiked a few of the trails. 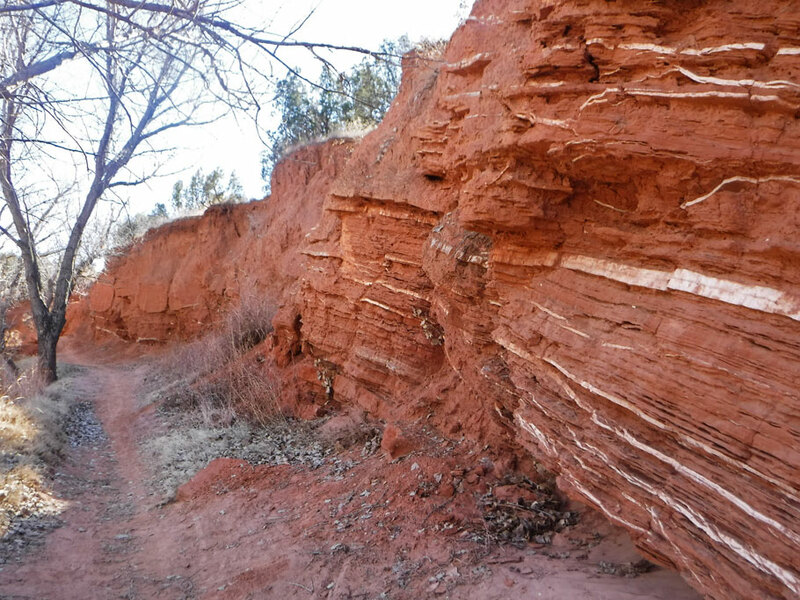 On the bottom half of this pic you can see the red claystone of the Quartermaster Formation geologic layer. Looking to the left the next layer up is the yellow, gray-green, and lavender of the Tecovas Formation. Sandstone and gravel form the Trujillo Formation. And limestone cliffs easily seen at the top right are from the Ogallala Formation. The white layers within the red claystone are gypsum, left behind as the sea receded from this area. 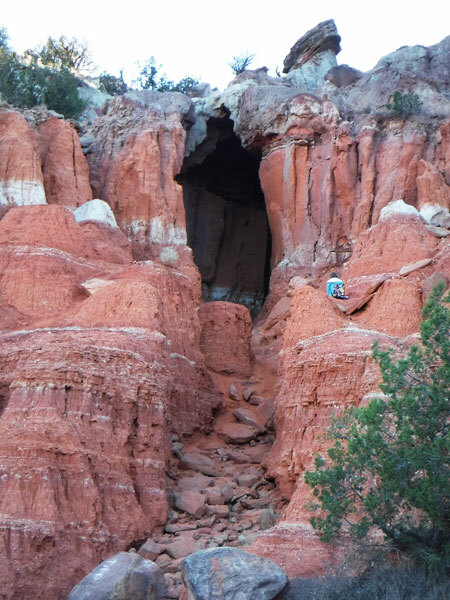 We have more exciting things to share about gypsum strata in a future post. View from the Sunflower trail. You can see more gypsum layers in the center. View from one of the lower river trails. The red claystone we’re walking on was here during the Triassic age, when the first dinosaurs lived. Looking east from a river bottom trail. Looking from deep in the canyon back toward the visitor center. Late in the afternoon, but it’s still sunny on the eastern side. The Big Cave on the western side of the canyon. Ballena Blanca en Palo Duro. Goodnight Palo Duro. We’re heading back to our Texas rest stop. Warning! In the next paragraph people donâ€™t get along with each other, and lots of animals die. If thatâ€™s too disturbing, stop here. The Red River War or Buffalo War was fought in 1874-75. Colonel Mackenzieâ€™s 4th cavalry was sent here to round up the Kiowa, Comanche, and Cheyenne, and take them to a reservation in Fort Sill, OK. In a surprise attack he captured 1,400 of their horses and burned all of their supplies. He had 1,100 of the horses shot. The tribes had to surrender. A few years later most of the canyon belonged to rancher Charles Goodnight. 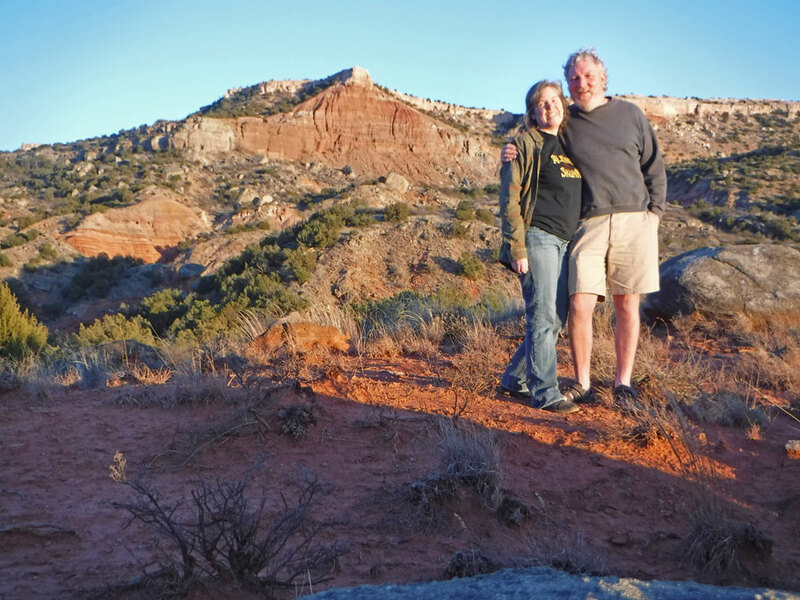 A group of natives, led by Quannah Parker, skipped out of the reservation to return to Palo Duro and hunt buffalo. Instead of buffalo they found Goodnightâ€™s cattle. Although Goodnight didnâ€™t approve of them helping themselves, he and Quannah Parker soon came to terms. Goodnight let them eat two cows a day until they could return to Fort Sill. 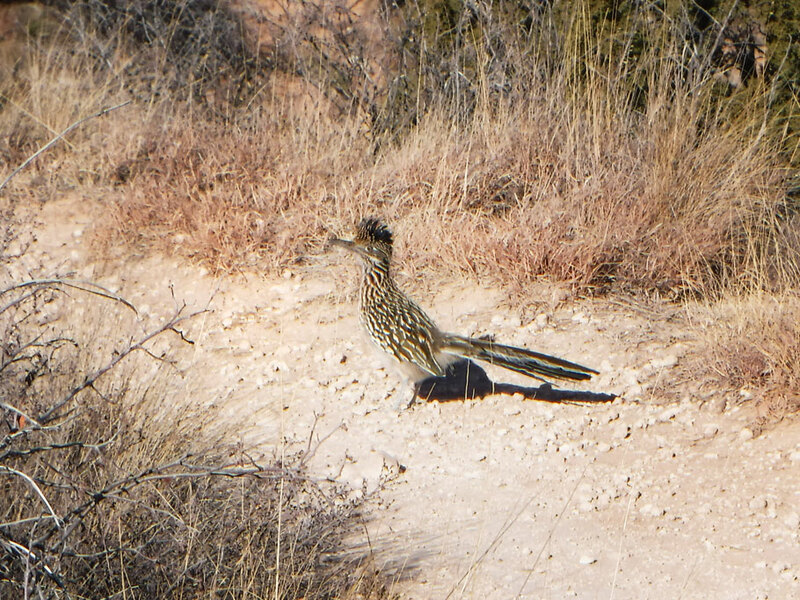 This entry was posted in Texas, Travel On The Dirt and tagged Canyon, Gypsum, Palo Duro, Roadrunner, Texas. Bookmark the permalink.